When we left Nuremberg we knew that the Danube part of our journey was over. Overnight our ship, Bragi, had crossed the continental divide, that invisible border in the mountains that separates where raindrops will end up: The Black Sea or the North Sea. Our morning balcony view heading toward Bamberg, Germany. Last night, we'd been warned that we might be late to dock in Bamberg. Apparently, someone was holding a regatta through the Main-Danube Canal, and as a result our ship would be competing for lock time. Luckily for us, we got through with no issues. We docked on time in Bamberg (9:00 am) and everyone got on the buses quickly. 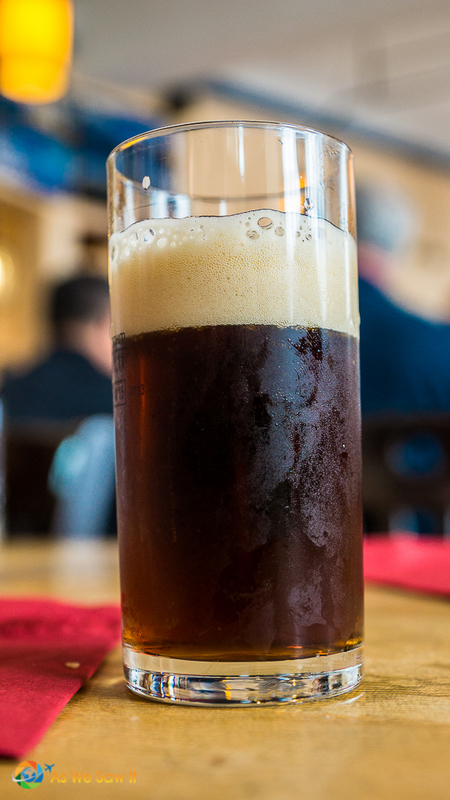 We chose option #2 because Bamberg is famous for a smoky-tasting beer called rauchbier. This meant that we wouldn’t have any free time on our own, but we didn’t mind. After all, if we had been on our own we would have stopped at a tavern to sample their unique beer anyway. 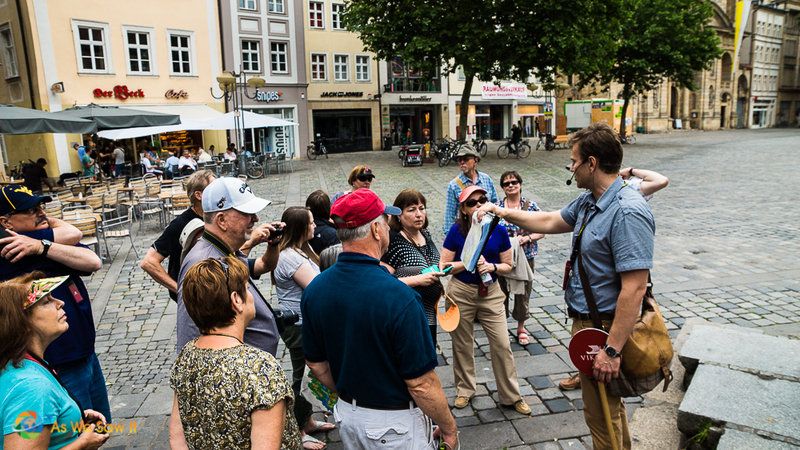 Our tour guide was an Adult Education student at the local university and had been living in Bamberg for seven years. With his perfect English and German accent, we never would have guessed he was actually Belarusian. He knew an awful lot about Bamberg’s history and architecture. Bamberg has never had a railway lines or major industry, and that turned out to be a blessing during World War 2. Railways and industries are often bombed during wartime in order to cut off the enemy's supply chain. However, since Bamberg had nothing to offer the war effort, both sides left the city alone. 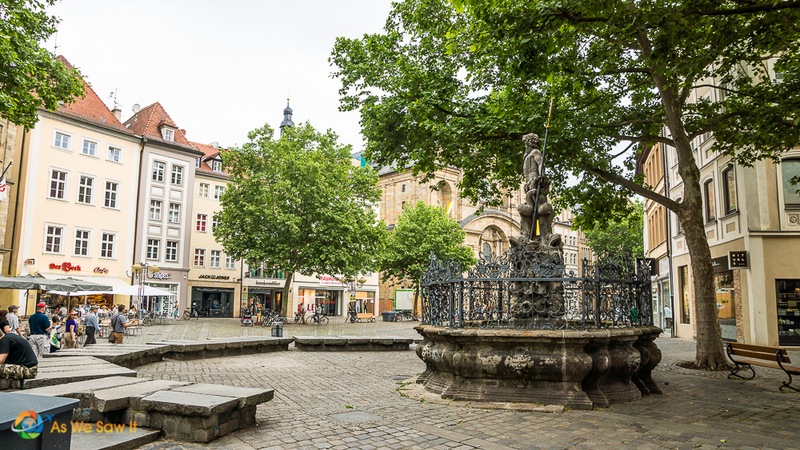 As a result, Bamberg still has an authentic medieval appearance, from its fountains to its skyline. This earned the old town UNESCO World Heritage status. 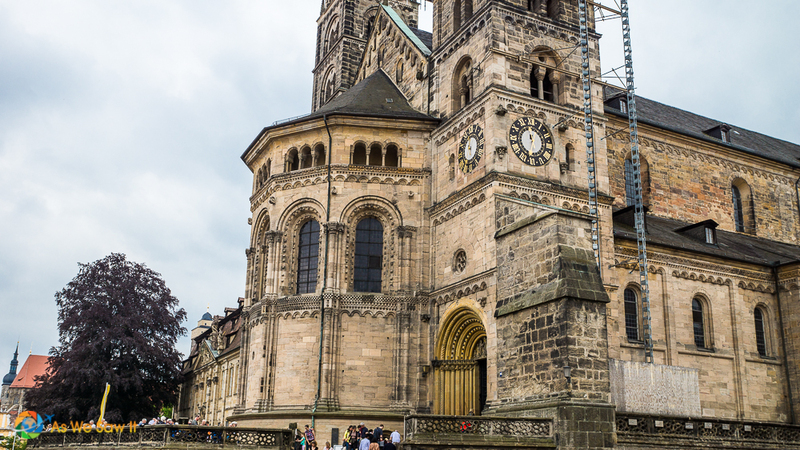 Bamberg Cathedral was begun in the early 11th century and completed in 1237. Inside is the ornate tomb of Emperor Henry II and his wife, which took 14 years to carve. Perhaps more notably, Pope Clement II is also buried here, albeit in a far plainer sarcophagus. As a side note, reform-minded Clement is best known for enacting prohibitions against selling church offices and roles. Could that be why he died less than a year after taking office, or is that a coincidence? Located next to the Cathedral, the Old Imperial Court, Alte Hofhaltung, was built in the 15th-century. Alte Hofhaltung once housed Bamberg’s Medieval episcopal court, and was the bishops' residence during the 16th and 17th centuries. The front is a neo-gothic stone facade, but inside is a romantic half-timbered style courtyard that has been used as a movie site. It is also a favorite site for local festivals. Most recently, the museum has added a permanent exhibition about Bamberg’s Jewish community. The bishops finally tired of their medieval digs around 1600 and moved to a new, renaissance palace across the square. 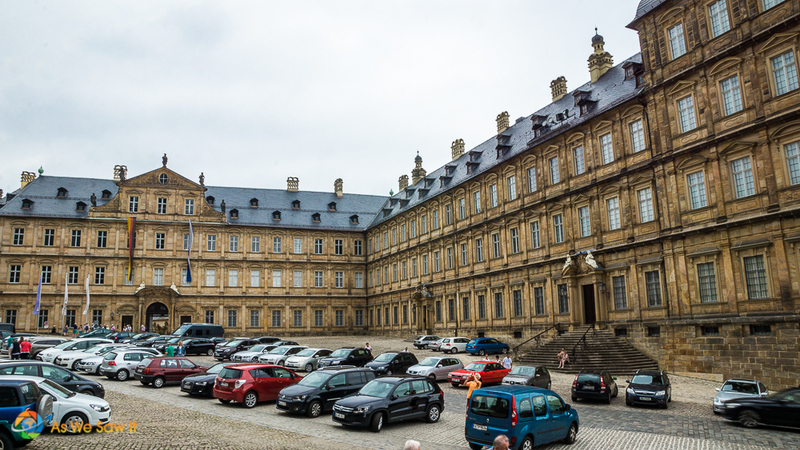 I wish we had been able to take a guided tour of the Neue Residenz (“new residence”) before we left Bamberg. The tour takes you through over 40 rooms preserved from the 17th and 18th centuries. The bishops' residence was massive, with ornate furniture and upholstery, frescoes, chandeliers, paintings and artwork. We did have the chance to see the rose garden in its inner courtyard, though. The bishops had the best of everything, that's for sure. 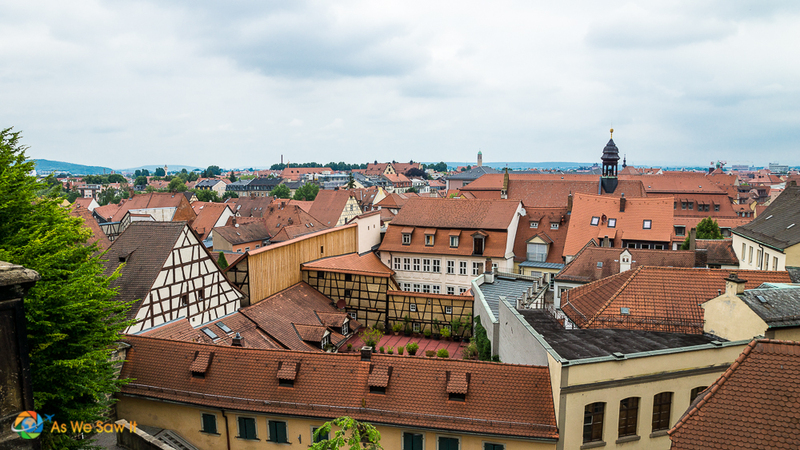 They even a fantastic view over the city of Bamberg, which you can see for yourself in our Bamberg photo gallery. 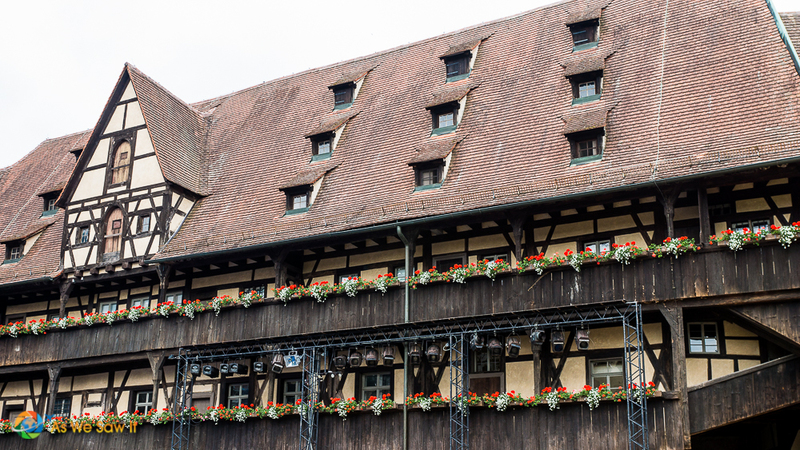 The fresco-covered Old Town Hall is probably the most-photographed building in Bamberg. It was built some time before 1387, and the Baroque addition that hangs over the water was built in the middle of the 18th century. As the story goes, the citizens wanted to build a town hall, but the bishop of Bamberg refused to grant them any land for it. The resourceful townsfolk figured out that if they built the town hall on the river, they wouldn't be disobeying the edict. They created an artificial island right between the episcopal and merchant sides of the river. 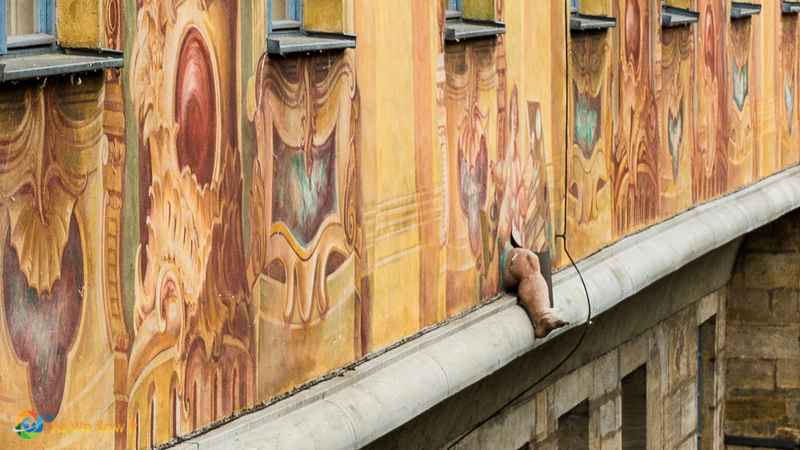 The most amusing part of the building is not the two competing architectural styles, it's the 3D sculpted cherub’s leg that pokes out of the mural on an outside wall. If you have the time, the building contains a splendid collection of fine porcelain (the “Ludwig Collection) as well as a remarkable Rococo Hall. 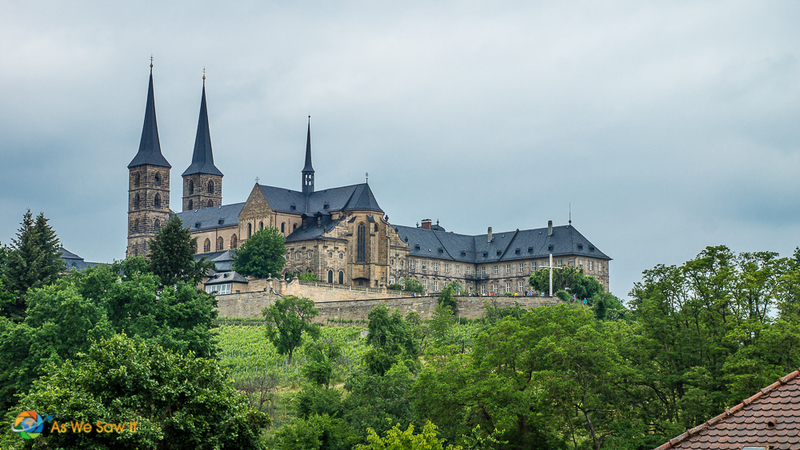 Michaelsburg Abbey began as a Benedictine monastery just after 1000 AD. 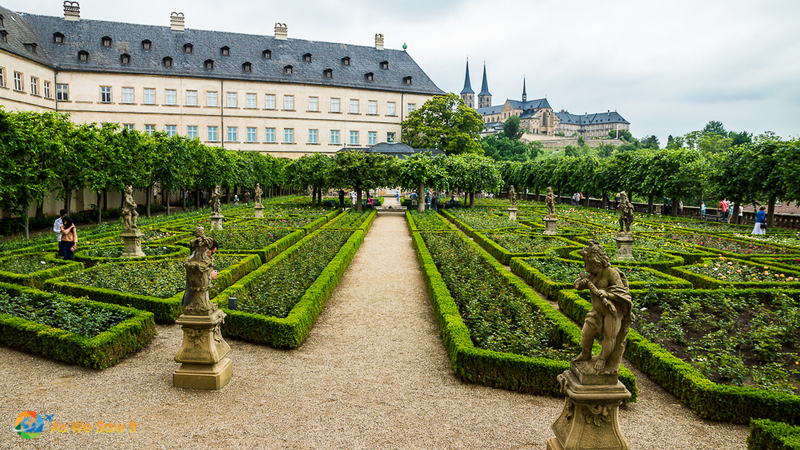 The complex includes a 12th-century church, newer abbey buildings dating from around 1700, and an old baroque terraced garden. It's a shame we weren't able to visit St. Michael's Church because I would have liked to see the its ceiling paintings of medicinal herbs. It would have been interesting to see what was being used to treat people back then. I don't know if it does, but I like to imagine that that terraced garden had a physic section dedicated to those herbs. If you visit, please let us know. Rauchbier? How do you smoke a beer? 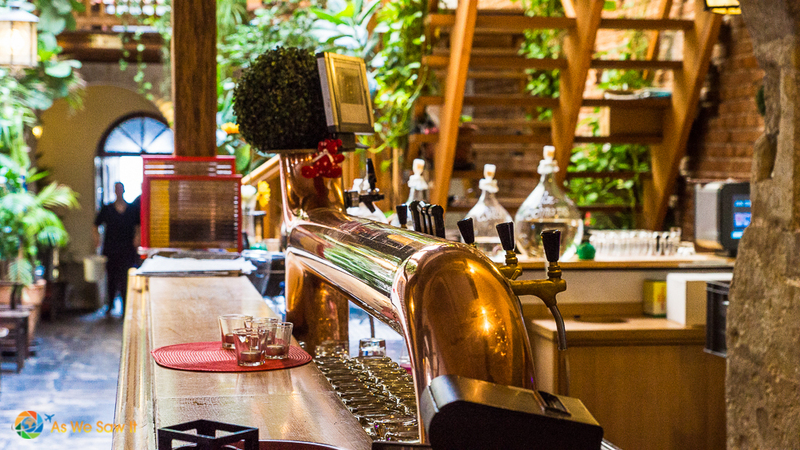 As well-known as Bamberg is as a UNESCO world heritage site, it is just as famous for its rauchbier (smoked beer). The famous beer gets its distinctive smoke flavor because they use malted barley that was roasted over a beechwood fire. Our final stop on the tour was to Schlenkerla, a family brewery that has been run by the same family for six generations. 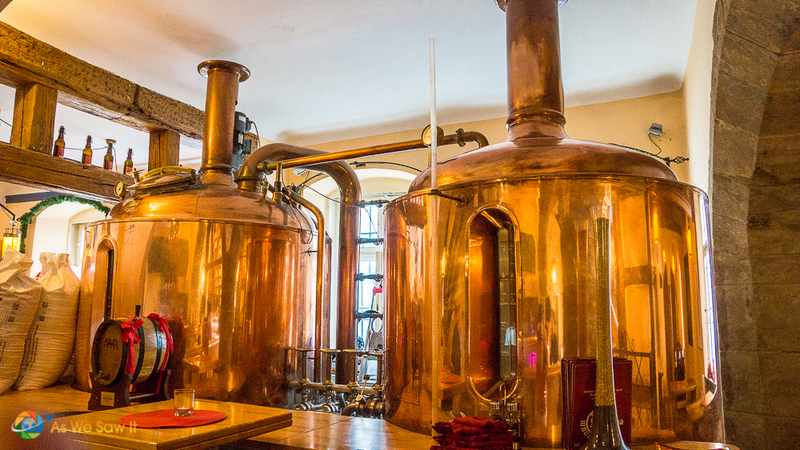 It is arguably the most famous of the seven breweries in town and may be the oldest Bamberg brewery as well, because it was first mentioned in 1405. They still maintain the old tradition of tapping directly from the wooden barrel. Schenkerla was a perfect end to our tour, as much for the atmosphere as for the unique beer. We were happy to have reservations, because it is very busy in high season. Our tasting included three beer varieties, and our waitress handed out pretzels and German mustard to help cleanse our palates between beers. 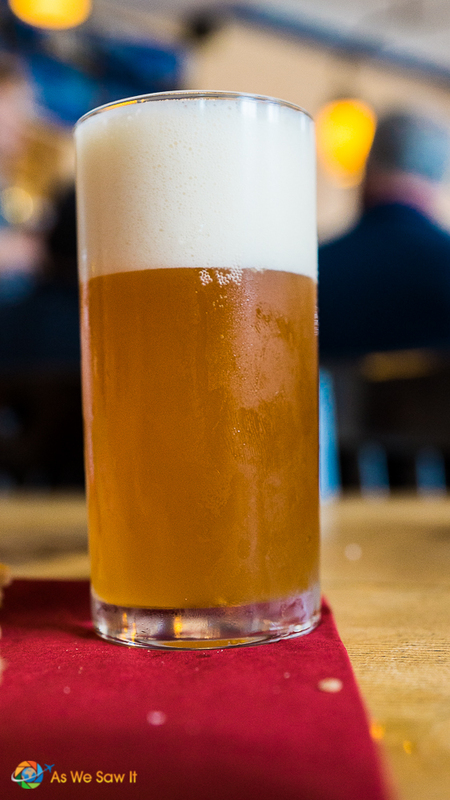 The first two, Urbock and Weizen, were made from the smoky barley. 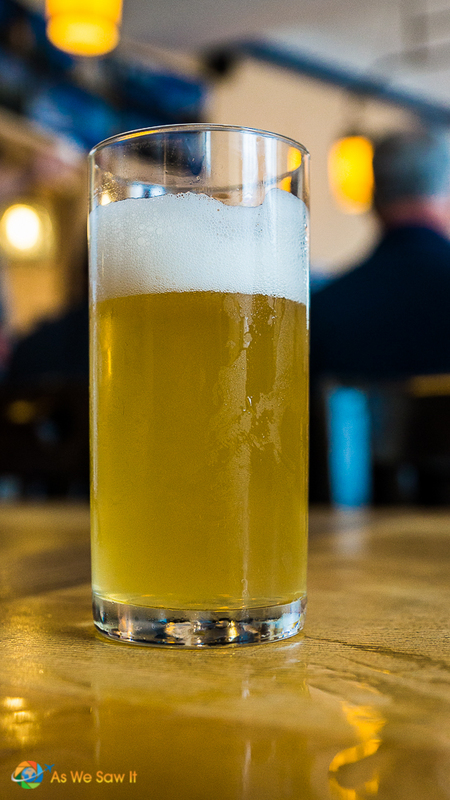 The final, Helles, is made from unsmoked barley but even so, it still had a smoky flavor due to it being brewed near the smoking operation. All three tasted like liquid smoke. Absolutely delicious. Tip: If you'd like to try Bamberg smoked beer, it is available in the U.S. at Whole Foods and Total Wine (check Schlenkerla's website for other locations). Our ship left Bamberg at 1:30, while we were enjoying a late lunch. We were supposed to have a presentation on Germany Today but thanks to the lecturer’s schedule it was postponed to Thursday. Dewi offered an impromptu presentation about some of Viking’s other river cruise destinations. She also shared more about their new ocean cruises, and revealed what she had heard about the company’s planned expansion to the Mississippi River. Update: Viking's plans have been postponed due to a snag beyond their control. I was pleasantly surprised that Dewi's talk had none of the “book-now-for-a-great-deal” vibe we’ve ad to endure on ocean cruises. She did mention that we could purchase a special coupon for $100 that would give us $200 off our next cruise, though. Considering how much a river cruise costs, I don't consider it a particularly impressive deal … but we might do it anyway. We shall see. Here are some ideas to help you plan your own trip. If this article was useful, you can thank us by using these links to make your plans. Some of these companies will pay us a referral fee, at no extra cost to you. Find more tourist information here. Lodging: Check hotel prices at HotelsCombined or Booking. Transportation: This website shows how to get anywhere by plane, train, bus, ferry and car. Private tours: Want a unique experience? We have had good experiences with Get Your Guide, a reputable source for booking a wide variety of local tours, attractions and activities. That's why we've chosen to affiliate ourselves with them. 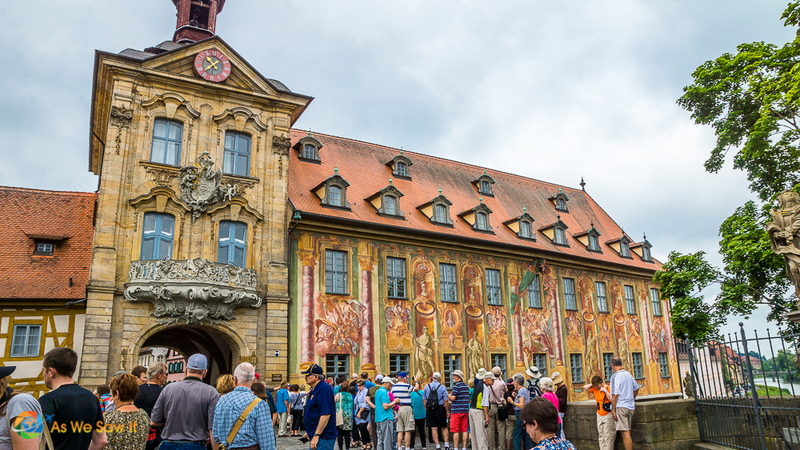 Find a list of Bamberg tours here. Want to see more of this destination? 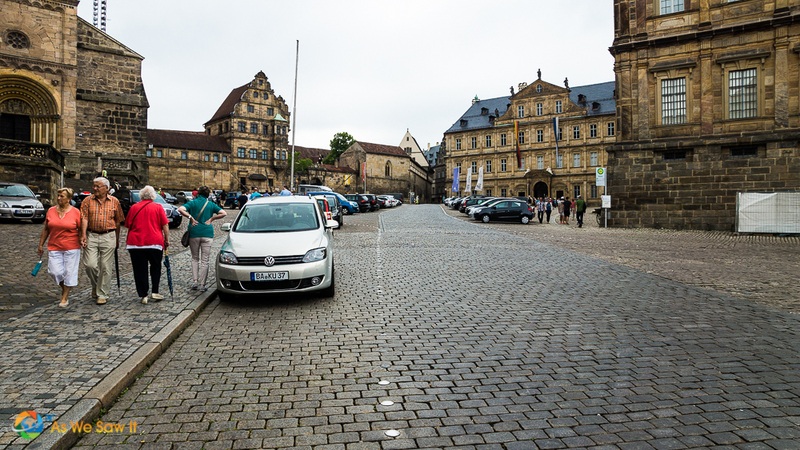 For more sightseeing, check out our Bamberg photo gallery. Get a bird’s eye view on Google Maps here. Zoom, scroll around and explore! 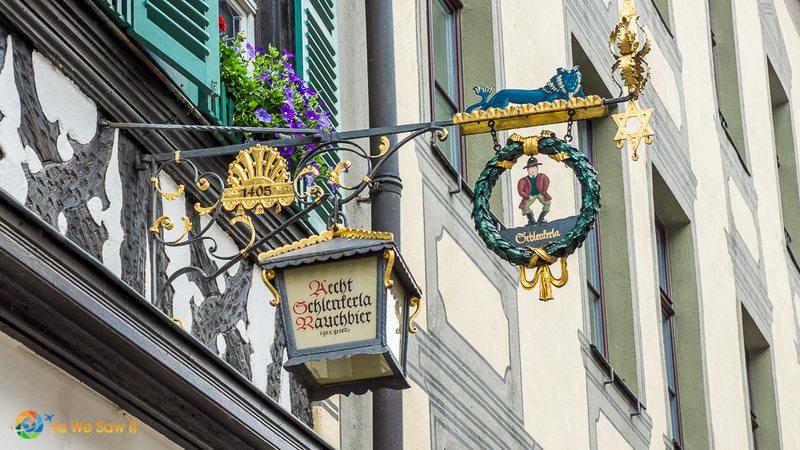 What Is on a Rhine River Cruise Itinerary?